DENVER (AP) At last, the Boston Celtics found a way to get a win in the closing moments. 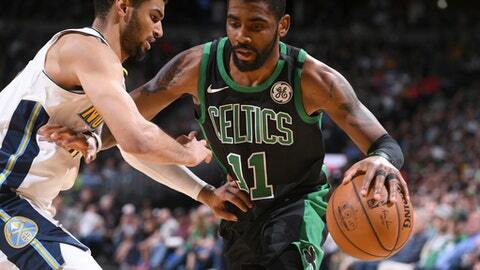 Kyrie Irving scored 10 of his 27 points in the fourth quarter, Jaylen Brown hit a go-ahead 3-pointer with 34 seconds remaining and the struggling Celtics edged the Denver Nuggets 111-110 on Monday night despite blowing a big lead. It was only Boston’s second victory in seven games. The Celtics had struggled in tight games over the last two weeks, with three losses in games decided by four points or fewer, including most recently a 109-105 loss to Golden State on Saturday. Denver nearly added to their misery. After Irving’s miss with seven seconds to go, the Nuggets – not using a timeout – raced up the court and got a look at the buzzer, but Torrey Craig’s tip-in of Will Barton’s long attempt from 3-point range was too late. Afterward, Denver coach Michael Malone defended his decision not to use a timeout to set something up. Irving finished 11 of 17 from the field to lead the Celtics. Jayson Tatum added 20 points and Marcus Morris had 14 off the bench. Boston blew a 20-point lead and trailed heading into the final period. Then the Celtics couldn’t hold onto a six-point advantage in the final two minutes as the Nuggets tied the game at 108 with 43 seconds to go. Moments later, though, Al Horford fed Brown for the decisive 3. The second-year small forward had missed his first four 3-point attempts. Nikola Jokic had a double-double by the first minute of the second half for Denver, finishing with 24 points and 11 rebounds. Barton scored 19, Gary Harris 15 and Jamal Murray 14. Mason Plumlee had 16 points and eight rebounds before leaving with a strained right calf in the fourth. The Celtics beat Denver for the second time this season, also prevailing 124-118 on Dec. 13. In this one, Boston made 10 of its first 16 shots from beyond the arc to go up 51-31 in the second quarter and led 56-45 at halftime. Irving paved the way with 15 points on 6-of-7 shooting. The Nuggets climbed back on the strength of a 14-5 run to end the half and outscored Boston 37-24 in the third to go up 82-80. Celtics: G Terry Rozier played despite spraining his right ankle at Golden State and scored eight points off the bench. The backup guard has played in every game this season. … Daniel Theis had 11 points and Horford scored 10. Nuggets: Jokic has recorded a double-double in 20 of his past 40 games. … F Wilson Chandler sat out with an illness. He’d been dealing with migraine symptoms since leaving in the first half of Saturday’s win over Dallas. … F Kenneth Faried played for the first time in four games and had zero points and five rebounds in five minutes. Denver’s starting center left the locker room on crutches and is not expected to play Tuesday at San Antonio. Irving had the hot hand for most of the night, but the big shot went to Brown. Irving was confident in his teammate. Brown finished with nine points. Celtics: Host the New York Knicks on Wednesday to open a three-game homestand. Nuggets: At the San Antonio Spurs on Tuesday, looking to end a 10-game losing streak at AT&T Center.